Giovanni Lanfranco painted at least six works that can be related to the commission to decorate the Buen Retiro Palace. 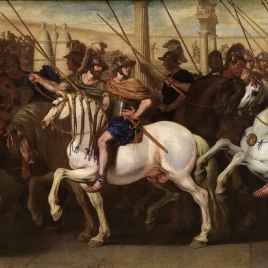 The first five are at the Museo del Prado -Auspices in Rome (P236); The Allocution of a Roman Emperor, (P2943); Funeral Rites for a Roman Emperor (P234); Gladiators at a Banquet and Roman Naumachia (P235)- while the sixth, Triumph of a Roman Emperor with two Captive Kings, belongs to Patrimonio Nacional (Inv. 100113395). The number and importance of the works he made for the History of Rome series make Lanfranco the most favored by that commission. Indeed, alongside Ribera, he was the most admired by the VI Count of Monterrey and Spanish Viceroy to Naples between 1631 and 1637, Manuel de Fonseca y Zúñiga. It is not easy the establish the chronology of these works, but the starting point is information provided by Lanfranco himself on December 10, 1637 in a letter to Ferrante Carlo. There he mentions a second commission by Monterrery for two new works, has he had already concluded a previous one for a number of works that he does not specify in that letter. Eric Schleier has offered the most convincing interpretation of this letter, suggesting that the three smallest works -Auspices in Rome, Roman Naumachia and Triumph of a Roman Emperor- probably correspond to the initial commission. Their less-sketchy character has always been considered an argument in favor of this suggestion. Moreover, there is no doubt at all that the figure pulling on a ram at the left edge of Auspices was reused by Lanfranco in Sampson and the Lion (Bologna, Pinacoteca Nazionale), which dates from 1635-1636. 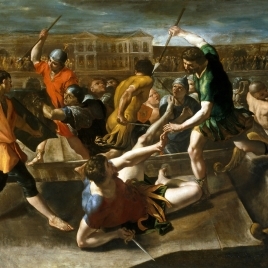 That, and the hurried technique shared by both works, with firmly constructed anatomies and tense musculature defined by violent shading, allows us to proposed 1635 as the approximate date for the present work, as well as the Naumachia and the Triumph. The greatest difficulties arise with the other three paintings, which are almost certainly later. Schleier noticed that the back of one of the preparatory drawings for the Funeral Rites has a study for the figure of God the Father present in the enormous Annunciation at the church of the Agustinas Descalzas in Salamanca, which was founded by Monterrey and concluded around 1635 or 1636. Those same dates could therefore be proposed for the Naumachia as well. 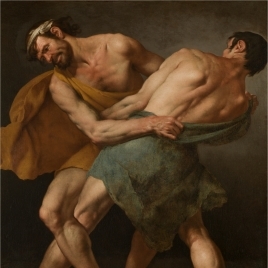 Lanfranco’s approach to these works must have been similar to that employed in other contemporaneous commissions, beginning with a meticulous study of the figures. 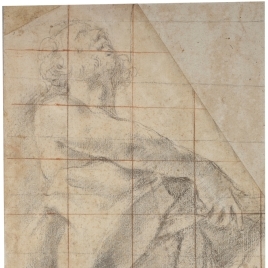 There are at least nine extant drawings related to these works, with complete figures and anatomical details. 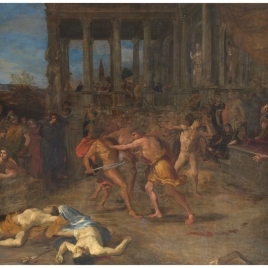 The best-documented canvas is Auspices in Rome, for which there are six surviving drawings, almost all related to the gladiators fighting in the foreground. It is very difficult to specify what artists influenced Lanfranco. 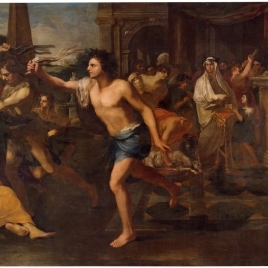 Poussin has been named repeatedly, and his influence is clearest in Lanfranco’s earlier works. Rubens should also be mentioned. 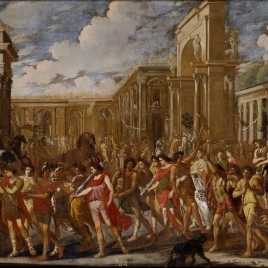 In recent decades, efforts have been made to establish the existence of a series of paintings related to the History of Rome -including the present work- that Philip IV’s representatives would have commissioned in that city and in Naples around 1634 for the Buen Retiro Palace. 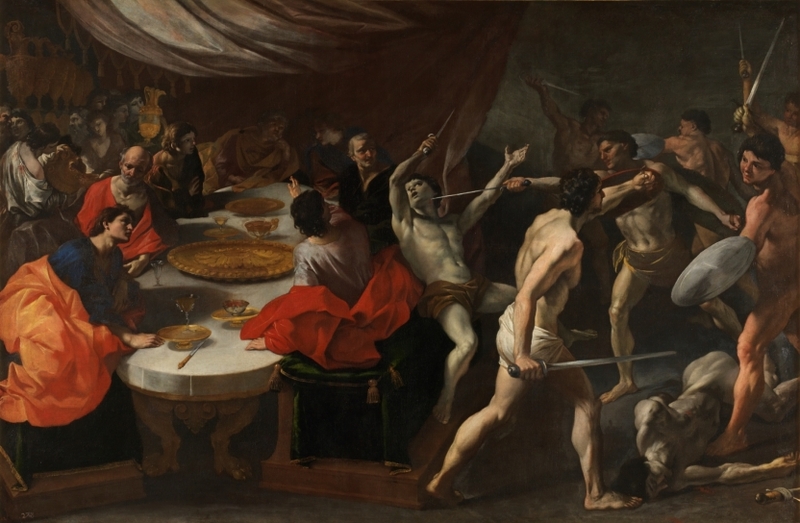 Today, twenty-eight extant works can be related to this project (most in the Museo del Prado or Patrimonio Nacional), along with another six mentioned in Charles II’s will but now lost or destroyed. This total of thirty-four paintings constitutes the largest group from the Retiro, including the Hall of Realms. The only larger group consists of mythological scenes that the king’s brother, Cardinal-Infante don Fernando, commissioned Rubens to paint for the Torre de la Parada. The size of the Roman group is the first indication of its importance in the new palace (Text drawn from Úbeda de los Cobos, A. in: El Palacio del Rey Planeta. Felipe IV y el Buen Retiro, Museo Nacional del Prado, 2005, pp. 169-170; 206-209). Height: 232 cm. ; Width: 355 cm. Royal Collection (Buen Retiro Palace, Madrid, 1701, no. 278; New Royal Palace, Madrid, "paso de tribuna y trascuartos", 1772, no. 278; New Royal Palace, Madrid, "antecámara de las señoras infantas", 1794, no. 278; Royal Palace, Madrid, "pieza de entrada para la habitación de la reina de Etruria que esta de blanco", 1814-1818, no. 278). Ponz, Antonio, Viage de España: en que se da noticia de las cosas mas apreciables, y dignas de saberse, que hay en ella, VI, Atlas, Madrid, 1793, pp. 36. Inventario Palacio Nuevo, [s.n], Madrid, 1794, pp. nº13947(378). López Jiménez, José Crisanto, Una tabla leonardesca en Murcia, Archivo español de arte y arqueología, 32, 1959, pp. 325-326. Pérez Sánchez, Alfonso E., Pintura italiana del S. XVII en España, Universidad Fundación Valdecilla, Madrid, 1965, pp. 159. Pérez Sánchez, Alfonso E., Pintura italiana del siglo XVII: exposición conmemorativa del ciento cincuenta aniversario de la fundación del Museo del Prado, Ministerio de Educación y Ciencia, Madrid, 1970, pp. 336. Painting in Naples 1606-1705: from Caravaggio to Giordano, Royal Academy of ArtWeidenfeld and Nicolson, Londres, 1982, pp. 188-189. Museo Nacional del Prado, Museo del Prado: catálogo de las pinturas, Museo del Prado, Madrid, 1985, pp. 358-359. Museo Nacional del Prado, Pintura napolitana: de Caravaggio a Giordano, Museo del Prado, Madrid, 1985, pp. 204/ lám.79. Barghahn, Barbara Von, Philip IV and the Golden House of the Buen Retiro in the Tradition of Caesar, Garland PublishingInc., Nueva York, 1986, pp. 250/ lám.975. Fernandez Miranda y Lozana, Fernando, Inventarios Reales Carlos III 1789-1790, Patrimonio Nacional, Madrid, 1988, pp. 48. Buendía, José Rogelio, El Prado. Colecciones de Pintura, Lunwerg Editores, Madrid, 1994. 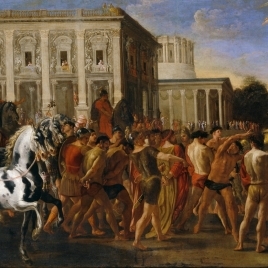 Buendía, José Rogelio, El Prado. Colecciones de Pintura, Lunwerg Editores, Madrid, 1994, pp. 317. Brown, Jonathan, Un palacio para el rey: el Buen Retiro y la corte de Felipe de Felipe IV, Taurus, Madrid, 2003, pp. 129/ lám.66. 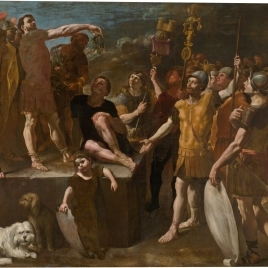 Quintana Calamita, Enrique, 'La limpieza de los gladiadores en un banquete de Giovanni Lanfranco del Museo del Prado' en In sapientia libertas : escritos en homenaje al profesor Alf..., Museo Nacional del Prado: Fundac, Madrid, 2007, pp. 315. Inv. Carlos III, Palacio Nuevo, 1772. Núm. 278. Inv. Testamentaría Carlos III, Palacio Nuevo, 1794. Núm. 278. Inv. Fernando VII, Palacio Nuevo, 1814-1818. Núm. 278. Catálogo Museo del Prado, 1854-1858. Núm. 1114. Inv. Real Museo, 1857. Núm. 1114. Lanfranco / 1114. Combate a muerte de gladiadores durante un banquete de patricios. / Cuadro de costumbres romanas en tiempo de algunos emperadores. / Alto 8 pies, 4 pulg; ancho 12 pies, 9 pulg. Catálogo Museo del Prado, 1872-1907. Núm. 282. Catálogo Museo del Prado, 1972. Núm. 3091.